"Cocote" starts with a frightening image of white and black smoke billowing towards the camera, obliterating the air and sky around it. In the foreground, the head of a cleanup worker or maybe a makeshift first responder—it's not clear—moves into and then out of the frame, busy at his unseen work. He is filmed in smudgy black-and-white. All you hear is the roaring whistling wind of a gigantic conflagration. Writer/director Nelson Carlo de Los Santos Arias does not cut away; he allows the image to dig its heels in, force you to look at it, to submit to it. "Cocote," filmed entirely in the Dominican Republic, is filled with such images, seemingly unconnected to one another at times and yet when placed in collage they create a powerful and visceral experience. De Los Santos Arias dives into the diverse and often conflicting cultures of the Dominican Republic, his home country, its devastating legacy of colonialism and its clash of religious beliefs. The story of "Cocote" is simple and eternal—a son required to avenge the death of his father—but the cinematic language de Los Santas Arias utilizes is startling, sometimes counter-intuitive, deeply effective. The central figure of "Cocote" is Alberto (Vicente Santos), a gardener for an upscale family in Santo Domingo. After getting the news of his father's death, he asks for the weekend off. The lady of the house assents but reminds him she will need him back by Monday. He travels home to his village, its poverty in stark contrast to the pristine swimming pool and manicured garden of his employers. Alberto is thrust into the round of mourning rites—the rezos—standing out in his crisp white shirt and tie. He is an evangelical Christian, and disapproves of these more "primitive" rites, arguing with his family about their superstitions ("Dad was cursed," "Dad had some black thing chasing him," etc.) At one point a charismatic female preacher pushes Alberto to his knees in the grass, praying over him for release from his family's "witchcraft". Alberto's father was killed by a man named Martinez, who is a cop and therefore untouchable. Alberto's sister Karina (Judith Rodriguez Perez) urges Alberto, with increasing fury, to do something about this injustice: it is his duty as a son to kill Martinez. But Alberto can't bring himself to take decisive action, calling to mind another son who famously hesitates to avenge his father's death. De Los Santos Arias filmed the rites with non-professionals, people who had recently lost someone in their community. He shot the sequences himself, all hand-held, catching what he could of the writhing agony, the bongo drums and bells, the chanting prayers. This is basically documentary footage, captured by his superb eye. In the background are nature sounds, wind and rustling leaves, screeching birds, crashing surf. There are times when a person, in those crowded rooms, stands in front of the camera for 15, 20 seconds, wiping out our view of the noisy scene beyond. We are kept distant from the action, we are voyeurs. This is by design. It's a sometimes frustrating but always fascinating approach. 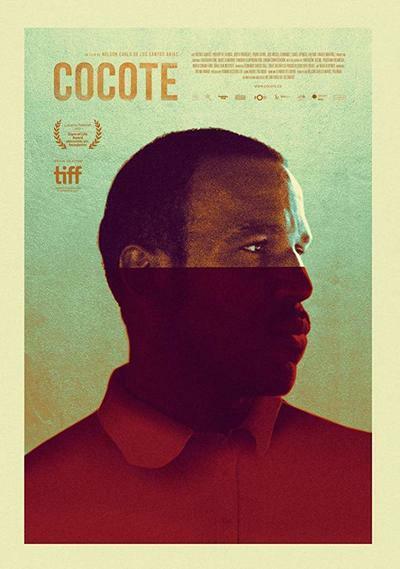 As de Los Santos Arias explained in an interview with Film Comment: "[Cocote] means 'neck,' and that’s only in the Dominican Republic. The Spanish of the Dominican Republic is very, very different. Everywhere in Spanish they say cojote, but in the Dominican, we say cocote. Cocote is the neck of an animal, not a human being, and it has a lot of meaning. When you say cocote, it implies violence. It’s the idea of a neck of a chicken that you are going to break." Animals crowd the frame, dead and alive. Mangy dogs run around barking. Beheaded chickens lie flopped in a pile. There is a stark black-and-white shot of a mound of dead fish drying in the sun. Alberto wanders through, an uneasy choir boy watching people chop off the heads of chickens, peeling the skins off of goats, unable to stop it, unable to protest. De Los Santos Arias switches from black-and-white to color and back. Images repeat: a black-and-white shot of Alberto's face as he whizzes along on his motorbike, trees above him, sun flaring out the lens. He moves from the modern capital back in time, to a place with no electricity, let alone limpidly peaceful swimming pools. Television footage sometimes interrupts the action: a man exorcises himself with great panache, an old man tells a reporter about how his rooster said the words "Christ is coming." Alberto is pained by what he sees as a credulous and lost world. There are experiments in lighting and in focus. Headlights pierce through inky blackness, weaving towards the camera, an image both gorgeous and ominous. Sometimes what happens outside a window is brightly visible, while the figures inside, closer to us, are in shadow. There is a beautiful moment where Alberto stands on a crowded street staring off-camera. He is in the foreground, but he is blurry. The background filled with green trees, and a person trudging by hidden beneath a huge sheaf of grass on his back (Birnam Wood moving?) is in vivid focus. These are destabilizing and exciting choices calling into question commonly-used cinematic tropes. There are a couple of eye-catching 360-degree pans, with arguments and conversation heard in fragments outside the frame. Life goes on even when the camera isn't on its subject. The final time de Los Santos Arias uses this device, its possibilities as a storytelling technique are tremendously clear. Alberto emerges from the dark forest, moving towards a potentially deadly confrontation, and by the time we get around to the starting point of the shot he has vanished into the night again. In one spectacular scene, Alberto visits a local policeman to discuss pressing charges against Martinez. Filmed in one long unbroken take, Alberto and the cop sit in the makeshift police station, their figures in stark black silhouette against the tropical green-blue ocean outside the door. Slowly, they get up and walk outside into the light, moving across the street, talking about helplessness in the face of rampant corruption. The cop relates a horrifying story about his girlfriend being raped in front of him by another cop. Surrounded by such breathtaking Caribbean beauty, the contrast could not be more devastating. "Cocote" is not designed to draw you in. It holds you at arm's length. There is something refreshing about such rigor. This is a challenging piece of art, but the challenges yield great rewards.